Well… Prosecco and nibbles — wonderful artichoke dip, goat’s cheese and black olives, smoked salmon sandwiches and little cheese scones topped with prosciutto followed by bite sized strawberry meringues. Anyway — it seemed to work. We launched Iolo’s Revenge locally on Saturday. It was carnival day and the streets were decked with flags and the numerous pubs overflowed with revellers in fancy dress. Having an artistic director of our own helped — Wendy, the artist who illustrated the book, and who goes to lots of private viewings of exhibitions, colluded with bunting, flowers and colourful napkins. She also exhibited some of her original artworks that head every chapter. The previous night I had fallen from the kitchen work surface while retrieving a jug from a top shelf — the jug was smashed but I survived, stiffly, despite the numerous tellings-off. Alan’s son, Daniel, saved the day, by putting out the chairs and remembering all the things I forgot in my percussed and anxious state — including the TV for the silent film show that had taken me weeks to prepare. There was a good turn out on the night — about 100! There I am, above, talking to some of them. The readers: Libby, Alan and Gay did us proud. The guests all laughed in the right places! Wendy posing with Su and Richard Wheeler, of Logaston Press, taking a break from selling books, while I catch up with the signing! (I turned to see if anyone had noticed). It had reached out from the wall and grabbed me. though I’ve never been to New York. 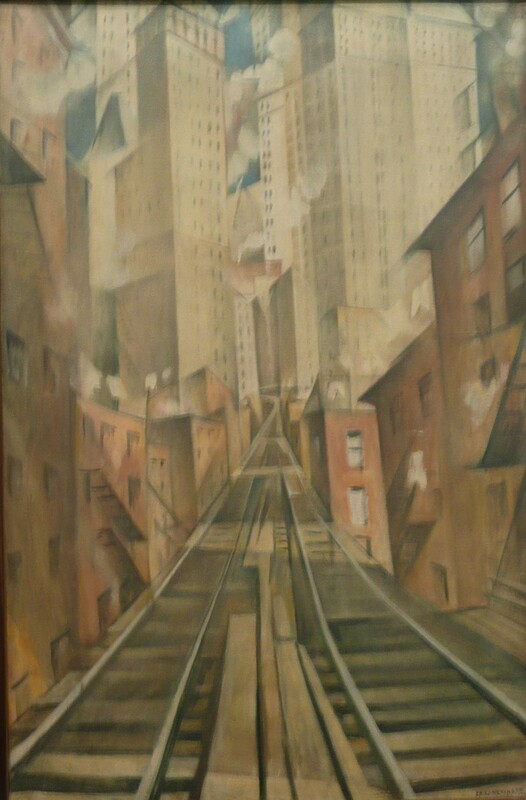 Wide-eyed and gripped by New York in 1920 and never so moved before by art, I was perplexed. Even more so when I found this! You see — it’s not the same image at all — just an essence, the blowing steam, the style, and I was a child when I last saw that picture. But still I spun round when I saw through the same eyes, sixty years later — the eyes of CRW Nevinson. What does this tell us about art? Here I am looking the other way! P.S The artist renamed the picture which is now on show at the Tate Britain when he fell out with American critics years later, it had been New York — an abstraction, it became The Soul of a Soulless City. This explains the disparity between the positivity of the image and the negativity of the title, I don’t believe he thought the city soulless when he painted it! 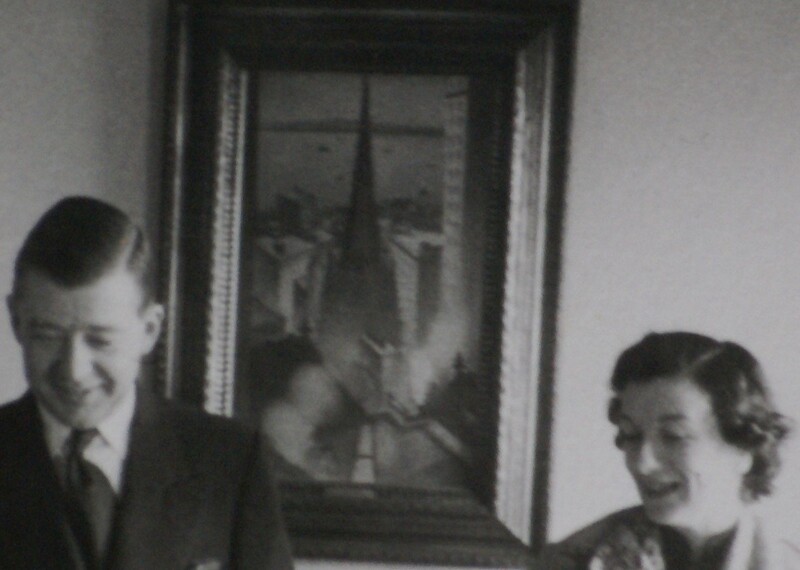 My grand-parents picture was sold many years ago — perhaps to a conciliatory American. ‘It’s the building with the huge golden knob on the top,’ said the handsome soldier recruiting in Victoria Square. 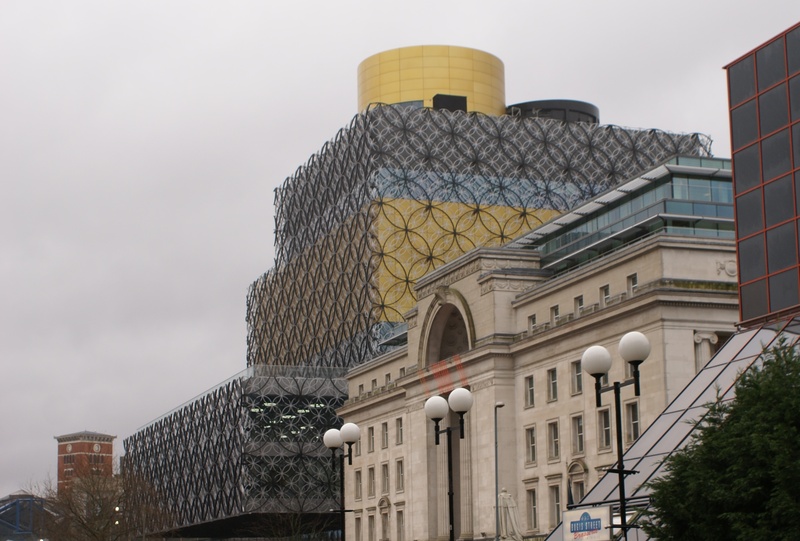 He had real leadership potential — I found it immediately — the Library of Birmingham. He could have said, ‘the three tier cake with squiggly icing, or ‘the Spirograph Building,’ that would have found it too. And at the very top, the golden knob illuminates the whole — the hole in the bibliographic doughnut. Next to this enormous roof-light is the Shakespeare Memorial Library, remember we are near to the birthplace of the bard. This has travelled through time and space and been given new life on the roof of this iconic building, designed by Francine Houben of Mecanoo Architecten and opened in 2013. 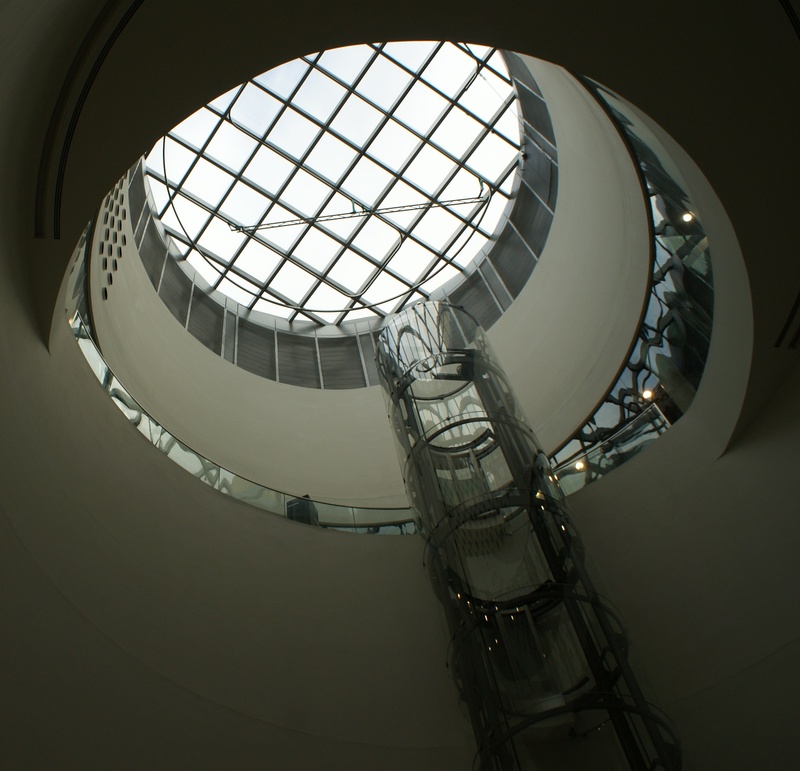 Nothing is perfect though: the glass lift was out of order, to the great relief of my lift-phobic friend, and the route to the top was through a warren of corridors, the ceiling of which I could easily touch — two meters perhaps. ‘Why so low?’ asked friend (her son is 6’8” tall).